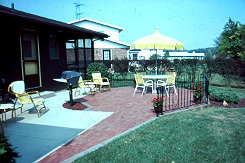 Do-It-Yourself Patio installation with no prior site construction knowledge. Doing the easy way just does work out too well. 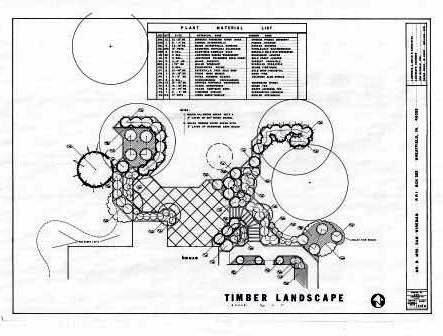 If you are going to Do-It-yourself, either research online, Landscape Construction books or hire a Landscape Consultant to provide the proper details and construction know how. 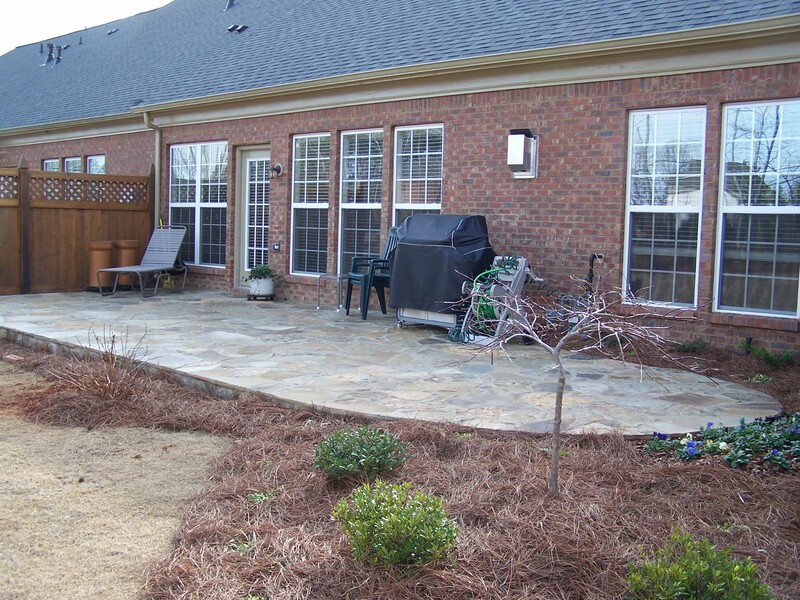 The finished patio will be usable and something that you can take a lot of pride that you did the job yourself. 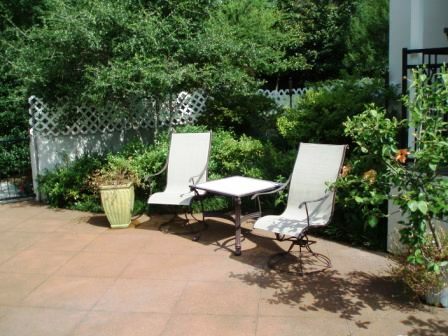 Crab Orchard Flagstone set in concrete makes a beautiful patio. It is best to hire a good stone mason that has many years of experience. 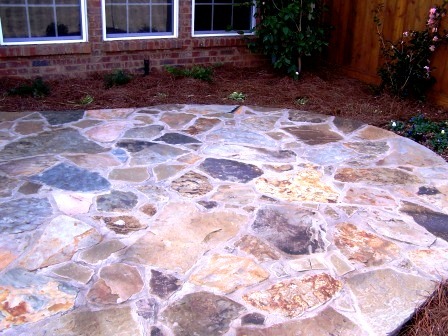 The proper cutting and blending the different color stones to make the patio that you see in the picture. 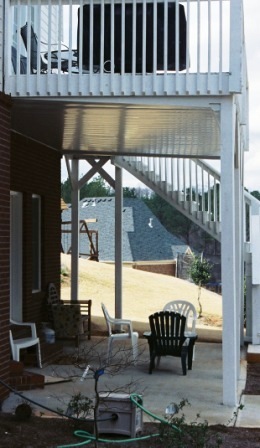 The patio design should repeat the lines of the adjacent deck or the pattern of the planting design. 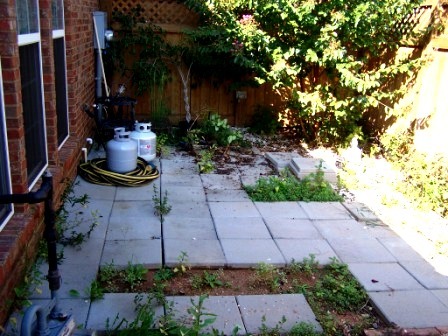 The base for the patio can either be sand or granite fines. It must be compacted and leveled before the brick or Concrete Pavers are placed. 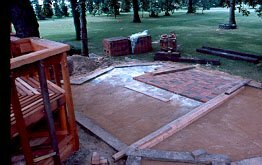 If the site is property prepared, The pavers will be easy to installed. A electric Brick cutter can rented to make the many cut needed to complete the project. A small concrete patio was enlarged by adding a pressured treated timber edge and installing a brick addition. 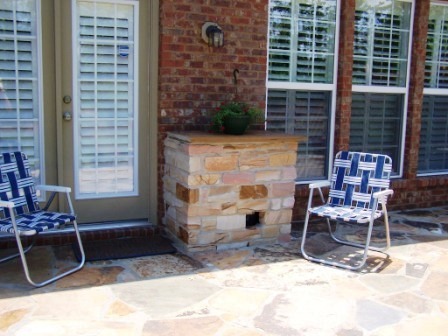 The natural gas grill was already at the location that you see in the picture and it was close to the kitchen door. 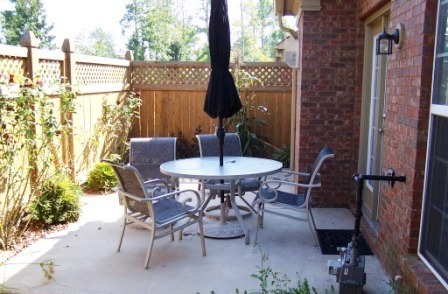 This condo Patio was too small for entertaining and the table and chairs was too close to the door for people to move around. 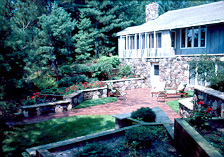 The existing concrete patio was enlarged and flagstone was added on top. The unsightly gas meter was in a bad location. The stone box that you see in the picture on the right covered the unsightly gas meter. The top stone piece is removal for servicing and the hole toward the bottom allows the gas meter to read. This was approved by the local gas company. You should check with your gas company before using this idea. 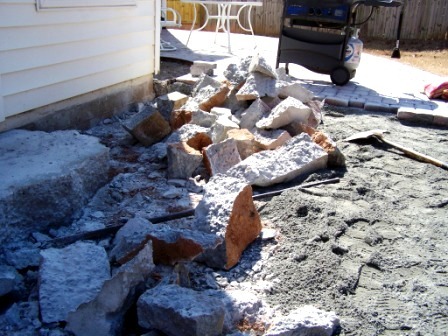 Removing an old concrete patio might be a bigger job than you think. This patio was 10 to 12 inches thick instead the normal 4 inches. There was no way on knowing until the removal was started. Surprise! !